budgets. If you are like my family, we love to vacation! 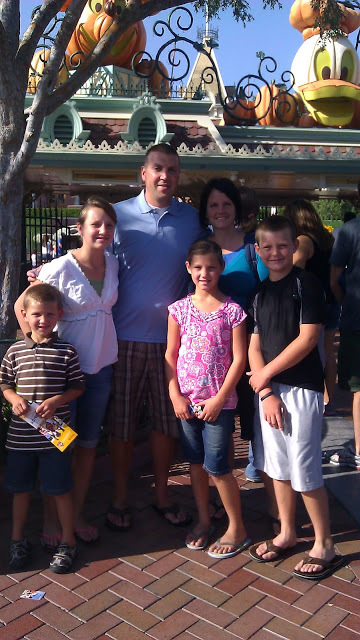 With a family of 7 however, the food portion of our vacations can sometimes price our trips out of our reach. Besides the hotel costs, the food expenses can be the next highest cost of a trip. 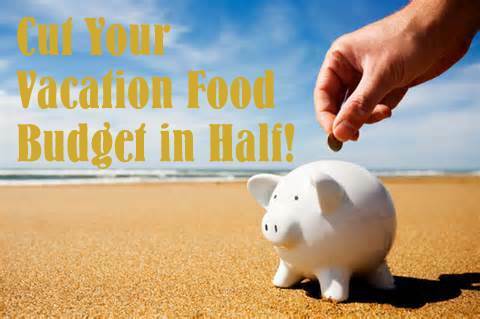 I am excited to share several tips that will help you cut your vacation food budget in half (or more) and help you save money so you can do all of the fun things you are hoping to do this summer. 1-Know your food budget before you go on vacation. If you don’t have an idea of what you want to spend on food, it is easy to over spend. Food can add up quickly and be a hefty part of your total vacation cost. Know what you can afford and how much you want to spend, and try to stick to those figures. Knowing your budget will help you determine where and what you should and shouldn’t eat during the week. 2-Do some research and have a plan before you leave. Before going on your trip do a little research and put together a plan of where you will be eating for each meal (whether in the hotel or out to eat). Find what food options are in the areas you will be visiting and find places to go that have discount coupons or specials. By simply doing a Google search you can find discounts on many of your favorite places to eat. An example of this is restaurant.com where you can get up to 50% off many restaurants in the areas you will be visiting. Whether you are eating out each meal or cooking from your hotel it is good to know where you are going and know a rough estimate of how much you will be spending on food. 3-Stock up on snacks, treats and vacation items throughout the year when they go on sale. a. Book a hotel with a microwave and/or a mini fridge. If they offer free ice, you could even do without a fridge. Many times a hotel with a mini kitchen or microwave is only a few extra dollars a night but can save you big on your food budget. Having a microwave can make meal prep easy in your hotel. b. Bring the right tools. When I travel and plan on cooking in our hotel there are a few must-haves that make it much easier for me. I always bring an electric skillet. Not a flat griddle, but the skillets with the two inch sides. It is amazing what you can cook or warm up in these skillets. I can cook nearly every breakfast, lunch and dinner recipe I want between a microwave and a skillet. The skillet can be easily packed and is large enough to cook food for a large family of 7 like my own. It is also smart to bring paper products, plastic utensils, a kitchen scrubber, paper towels, and a small container of dish soap to make clean up a cinch. c. Choose the right hotel (or accommodations) that allow you to prepare homemade meals in your room(s). Booking a hotel with a continental breakfast is not always the least expensive way to go. Most of us can eat a pretty simple breakfast and be fine (toast, bagels, cereal, fruit, yogurt, etc.). Many times the hotels that offer the free breakfast will charge you more than it would cost for your family to eat your own breakfast in the hotel room. If you can find a hotel with a reasonable continental breakfast and the price is not more than you could feed your own family breakfast then that is a good option. Below are several meal options for breakfast, lunch and dinner that are easy to prepare and serve in a hurry. If you are flying to your destination you could easily make a quick shopping trip for some of these meals to make in your hotel without a lot of effort. Preparing homemade meals and serving in your hotel will save $100’s on your vacation budget. (can be cooked on an electric skillet brought from home)–bring a box mix or put the dry ingredients for a homemade pancake mix in a Ziploc bag and bring the wet ingredients separate. $25-$40. Here are a few of my favorite lunch options that can be brought from home. Add a bag of chips, some veggies or fruit and you have a complete meal at a low price. chips and you won’t be disappointed. cheese and you have a simple dinner. your grilled cheese for extra flavor. *Breakfast for dinner is another simple approach to dinner. A good old’ pancake dinner never hurt anyone for dinner and is much less expensive to make than most meat-heavy dinners. *Potato Bar-this is simple to make away from home if you just microwave the potatoes and cut up the toppings ahead of time at home. When ready to serve just open up the potatoes, place the toppings on top and you have a dinner ready in just a few minutes. I like Deals to Meals on FB. Great tips. So glad I follow both of you on FB! I also follow deals 2 meals on Pinterest. I follow Deals to Meals on Pinterest! I follow on facebook and love it! I like Deals to Meals on Facebook. I follow Deals to Meals on Pinterest. I posted a comment about the giveaway on my FB page. I liked you on facebook! Thanks! I like you on fb as Oursafehaven. I follow you on Pinterest as oursafehaven. I shared on my fb page…oursafehaven. I posted a link to this post on my FB page! I like you on Facebook (Julie Kreiger Wenning). Thanks! I follow you on pinterest (Julie Wenning). Thanks! I love your ideas for vacation meal savings! I'm definitely going to try some of them. Also, I have taken a slow cooker with us before, and just plugged it in at the hotel in the morning before we go somewhere. It's so nice to have dinner all ready at the end of the day! What a great service! You are a super smart woman! Following Deals to Meals on both Facebook and Pinterest. I liked the facebook post, but it says it is your old facebook page and I couldn't seem to find your new one, so I hope I did it right! I liked Deals 2 Meals on Facebook. Liked on Facebook! I did try to follow on Pinterest, but it said there was an error from your end so hopefully it's resolved soon because I'd love to get more recipe ideas! Hope that helps 😉 Thanks! I liked DTM on FB and am following on Pinterest. I left a comment about your giveaway on my own facebook page as well. One good thing by Jillee sent me. I like Deals to Meals on FB and follow on Pinterest! I have been following you on facebook for quite some time. I just followed “Deals to Meals” on Facebook and Pinterest. I liked Deals to Meals on Facebook! What a great post. My family did this growing up as well and I have continued it on as an adult. My husband and I saved a ton of money on our honeymoon doing this as well. Thanks for the ideas! Great tips! Enjoyed this post. I follow you on FB! 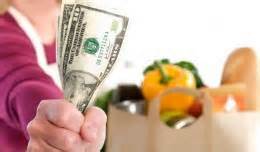 I love Deals to Meals, I tell everyone about it, because it makes saving money so easy. I liked your facebook page. I like Deals to Meals! Following Deals to Meals on Pinterest and liked on Facebook! I "liked" Deals to Meals on my Facebook AND left a comment about the giveaway! I am also following on Twitter and Pinterest too! PLEASE pick me!!! I like you on Facebook and follow you on pinterest! I would love to win! This was seriously a super great article. This year when we vacationed in Phoenix during Spring Break, I used DTM to help me plan my menus. It saved us a ton, and I really enjoyed having a plan for and serving nice meals on vacation. I'd rather spend money on other things! My least favorite meals were the couple we ate out. Besides doing your own cooking, I have found that I can save tons of money on vacation by finding a great home to stay in. I usually use vrbo.com. When we stayed in Phoenix, I got a huge gorgeous home with an oversized private pool for $125/night! (Granted there are always cleaning fees, and we paid extra to heat the pool, but it was still cheaper and sooo much more enjoyable than having to get 2 hotel rooms for my family of 8.) I always book last minute when people are usually ready to deal if they don't have their place rented. I have found that most owners will bargain with you in order to rent out more nights. I shared this post on fb, and I am using the menu ideas to make quick and simple meals for 50 dancers I'll be helping to feed while they are here for a festival all next week. I've shared this giveaway on fb via the link from this post. I liked DtoM on FB. I have a friend who almost always brings her crockpot on vacation with her. She says it's great to put soup in to reheat during breaks at the Amusement parks.